Welcome to Detech Australia! : The Man From Bulgaria. Well it's been a long time in the making, but with Marianne's hard work and persistence with our government departments. 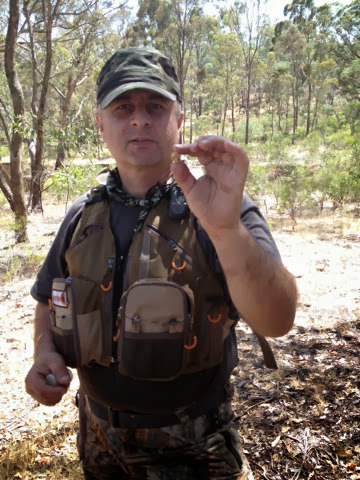 We finally have our good friend Slavi here in Australia to do some gold hunting. 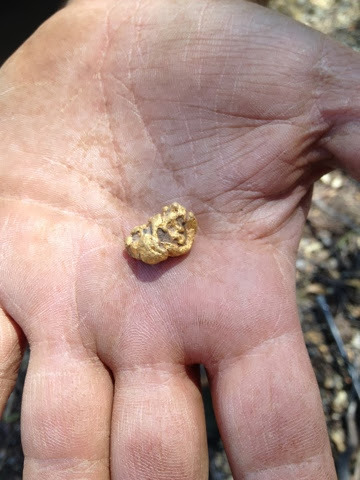 We've been nailing the usual feed of Nano gold, but the other day Slavi or Mr Slavi as I call him nailed a beautiful 12.5 gram nugget, these moments will be treasured by him and us just to see that look on his face. Weve been testing other coils the new 6" mono and also I have a proto type 15x8 DD. this coil came in very handy the other day after Slavi had picked up he's pride and joy. I slipped on the new DD coil, and worked with iron reject on to eliminate some of the iron Junk. Well it paid off I nailed a 3 gram nugget. Still more work to do in this area. Detech are going to send me an 8"DD coil for testing this will be handy for those tight places, and will give the older machines another option. The testing continues with the 8" mono and the 6" mono selling well more developments to come stay tuned.